The new Bryton Pick is an amazing product! I am someone who for some reason is always getting food stuck in my teeth .I will try anything to get it out. Yes I am that person you see using a piece of paper to fish food out from between my teeth. Well not anymore with the Bryton Pick. This is so easy for people on the go and you can even use it if you have braces. I love that it can be used multiple times and even comes with a puch that you can carry it it. I keep mine in my purse and pull it out whenever I need it. I gave the second one to my husband and he leaves it in his car. 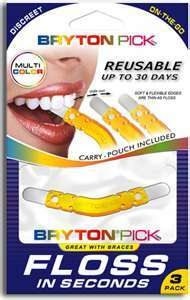 If you go to www.brytonpick.com there are fabulous directions about how to use the Bryton Pick. You keep your mouth in a smile so you avoid contact with the lip and then gently insert either end of the pick between the teeth. You next slide the pick between the teeth inside out. There is a note on the website for beginners to be careful on papercuts on your lip. I had to laugh when I saw this because I was totally one of those beginners who got a papercut on my lip when I did not follow the directions. Now that I follow them though I am a pro and no more papercuts. After each use you clean the pick with either a napkin, tissue or hot water. Then it is ready to be used again. The Bryton pick is 100% made in the USA and is for people age 10 and up. I highly recommend the Bryton Pick. Visit their website to learn more. I received one or more of the products mentioned above for free http://www.tomoson.com/ Regardless, I only recommend products or services I use personally and believe will be good for my readers.